NETWORK FINALS: There were no changes from the morning’s preliminary numbers. CABLE HIGHLIGHTS: ESPN’s telecast of the COLLEGE FOOTBALL PLAYOFF CHAMPIONSHIP was huge, but at 8.00 it wasn’t quite as massive as last year’s 8.26. Once again the sports conglomerate simulcast the game on several of its other outlets, but we only have ratings for ESPN2 at 0.23/803K and ESPNU at 0.04/72K. The game may have hurt VH1’s LOVE & HIP-HOP, down a quarter of a point from last week to 1.12, with LEAVE IT TO STEVIE down 0.07 to 0.83, K MICHELLE MY LIFE down a tenth to 0.68, and AMERICA’S NEXT TOP MODEL down 0.04 to 0.52 (the latter was also simulcast on MTV at 0.13). USA’s WWE telecast was at 0.99/0.99/0.92, compared to last week’s 1.11/1.11/1.08. 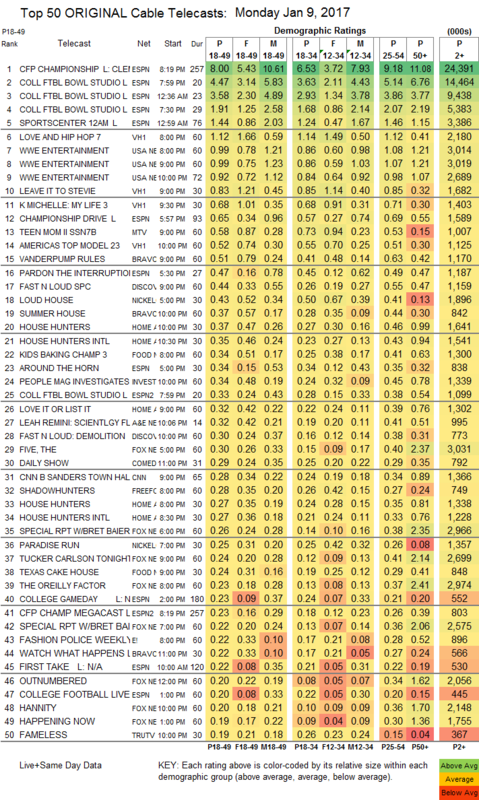 Prior to the TOP MODEL simulcast, MTV’s TEEN MOM was down 0.35 to 0.58. On Bravo, VANDERPUMP RULES ticked down to 0.51, and SUMMER HOUSE followed at 0.37, with TIMBER CREEK LODGE down 0.06 to 0.17. Discovery aired a FAST N LOUD special at 0.44, and then DEMOLITION at 0.30. On HGTV, HOUSE HUNTERS slipped 0.05 to 0.37, HOUSE HUNTERS INTL was down 0.04 to 0.35, and LOVE IT OR LIST IT was down 0.03 to 0.34. Food Network’s KIDS BAKING CHAMPIONSHIP dropped 0.05 to 0.34, and TEXAS CAKE HOUSE premiered at 0.24/0.18. ID’s just-renewed PEOPLE MAGAZINE INVESTIGATES rose 0.04 to 0.34. 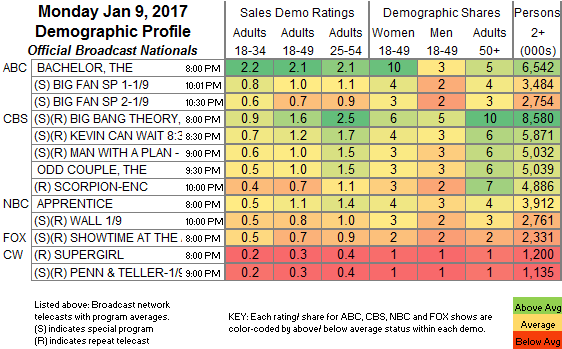 On Freeform, SHADOWHUNTERS dropped a tenth to 0.28, and the newly-renewed BEYOND was at 0.17, the network apparently unconcerned by the fall from last week’s 0.31/0.27.